If you’re looking to update your trusty little black dress, this elegant black midi dress by Cue is a stylish option. Made from soft stretch twill, the black midi features a draped neckline and cap sleeves. It has a metal buckle belt and is cut for a fitted silhouette. Look sharp in the tailored midi by hiring it for a work function or a cocktail party. Look sophisticated and confident at your next work function by styling it with black patent pumps and classic stud earrings. Grab a box clutch available to hire for a sleek finish. Check out our blog post on various ways to wear your favourite LBD! 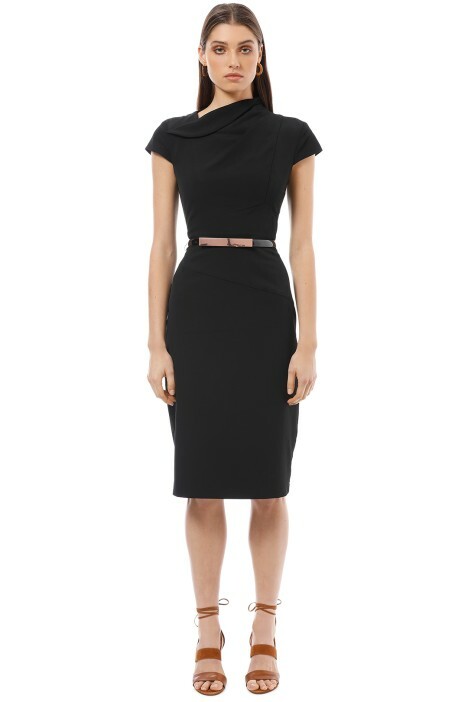 Draped Neck Pencil Dress is rated 5.0 out of 5 by 2. Rated 5 out of 5 by Natalie from PERFECT Work Dress! I am in love with this dress! It's so comfortable to wear, perfect fit for work .. figure hugging but in a very tasteful way. Rated 5 out of 5 by Amy from flattering simple and chic This LBD sat flatteringly on my shape, and the cute rose gold details added a little bit extra to the dress. It was comfy and my arms didn't feel restricted in the cap sleeves. The neckline is high, but not too bad.